Is Kris Bryant Really Sacrificing Power for Contact? It’s an interesting thing to think about that as far as MVP candidates go, Kris Bryant has managed, in the span of a year, to go from the choice for National League MVP to not even in the conversation. What’s even stranger about such a situation is that it’s not like Bryant has fallen off dramatically from a sophomore campaign that featured a WAR over 8. In addition to the early inconsistencies that his team experienced, some of the changes in his game might be leading to him being somewhat of an overlooked quantity at this point, even with the Cubs serving as one of the best teams in baseball since the All-Star break. Despite his virtual exclusion from any sort of Most Valuable Player discussion, Bryant has actually managed to improve in a number of ways. Sure, there are a couple of aspects in which he’s taken a modest step back, but overall, we’re still talking about a player that ranks at or near the top of the third base category in a number of ways on the offensive side of things. In fact, as far as his Off rating alone is concerned, Bryant ranks at the top of the 26 qualifying players at the hot corner, with his park-adjusted offense coming in at a 142 mark that trails only Justin Turner. Turner is also the only player that bests Bryant in reaching base overall, as Bryant has posted a .402 mark to date that has been the result of some adjustments he made over the course of last year’s offseason. In the case of Kris Bryant, we’re looking at a player that is experiencing something of an evolution. He had a stated goal of making more contact prior to 2016 and came into 2017 in hopes of driving the ball to the opposite field more. Those adjustments have certainly manifested themselves throughout the year, though it has come at the expense of his contact, at least in a modest sense. Now it just becomes a matter of putting all of those adjustments together, which have quietly made Bryant an even bigger offensive threat than he had previously been, specifically in regard to the OBP game. In large part, this comes down to Bryant’s pitch recognition more than anything. He isn’t feasting on one pitch type against other types and his heatmap from 2017 looks extremely similar to that of 2016. In a sense, that’s a lot more encouraging than any other development. His commitment to improving contact has proven to pan out, while that commitment to the opposite field has also been demonstrated, even if quietly, with an Oppo% of 22.3 that represents about a three percent increase from last year. If anything, it’s something. Of course, there are some very slight detractors from what has otherwise been an extremely impressive season for Kris Bryant. This is allegedly most identifiable on the power side, but more obvious in the hard contact element. His Hard% ranks just 19th among the 26 qualifiers at the position, dipping from 40.3 to 31.6. However, the positive there is that his Soft% has also dropped to only 14.8, which is the lowest mark of his career, which also ranks 19th among that group. 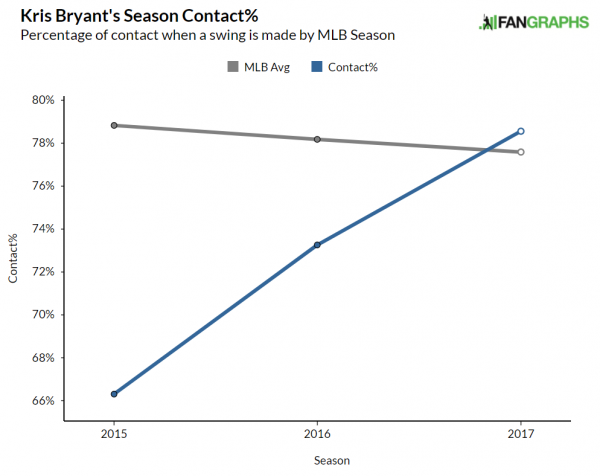 As far as the power numbers are concerned, there’s a perception of Bryant that his power numbers have experienced a significant dip. He’s sitting at 13 less home runs than last year, and his ISO has fallen by about 20 points. However, that’s still sitting at .241 which is the seventh-highest mark among the third base group. The most significant drop in production has come on the RBI side, where Bryant only has 63 to his name. As is the case with RBIs, that’s obviously not entirely indicative of his ability, but he has proven less productive with runners in scoring position, although it’s also worth noting that the number of opportunities to succeed in such situations have been fewer this year. It’s interesting to see a player that we’ve become so accustomed to knowing as a power threat first evolve into a player who has become such a significant contact and on-base threat, in addition to the power element that has already been well-established. It’s really difficult to say that he’s sacrificing the power aspect of his game, though. Homers are down, sure, but he’s still as big an ISO threat as many at the position. Combine that with the improvements that he’s made on the approach and contact side, and we can really say that Bryant has actually gotten even better since his MVP campaign a year ago. Even if nobody is paying attention this time around. We hoped you liked reading Is Kris Bryant Really Sacrificing Power for Contact? by Randy Holt! Oh hey, I did a very similar write-up two months ago right here (https://redd.it/6mzqhy). I found very similar results. Good to see that others have taken note.